Remember Orangutan Island? Well, get ready or some more amazing stories from BOS Nyaru Menteng! This 10-episode series will take viewers on a roller coaster ride of the adventures, trials and tribulations, heartaches, fun, friends, failures and successes of all the orangutans who attend the BOS Foundation’s unique school in a Borneo jungle in Central Kalimantan Indonesia. They are all orphans and are learning skills that one day will enable them to live once again in a true wilderness. With their rain forest habitat being destroyed by deforestation at an alarming rate there are currently over 300 students going through the school system divided up to suit the age and skill range from babies just a few weeks old, to teenagers and young adults. Through their lessons in baby nursery, forest school and the island “university” all these youngsters are adapting to the challenges of being taught survival skills by humans as they also deal with the ever-increasing social pressures of life in a tightly-knit community which could determine the future of their species. This incredible show has it all: friendship, romance, bullies, danger, drama, raging hormones, fear, humour, medical emergencies, heartache, rescues, reunions, attempted escapes, and even teenage pregnancy! And of course most importantly – actual release for graduates – back into the wild. Stay tuned.... Info on US airdates coming soon! 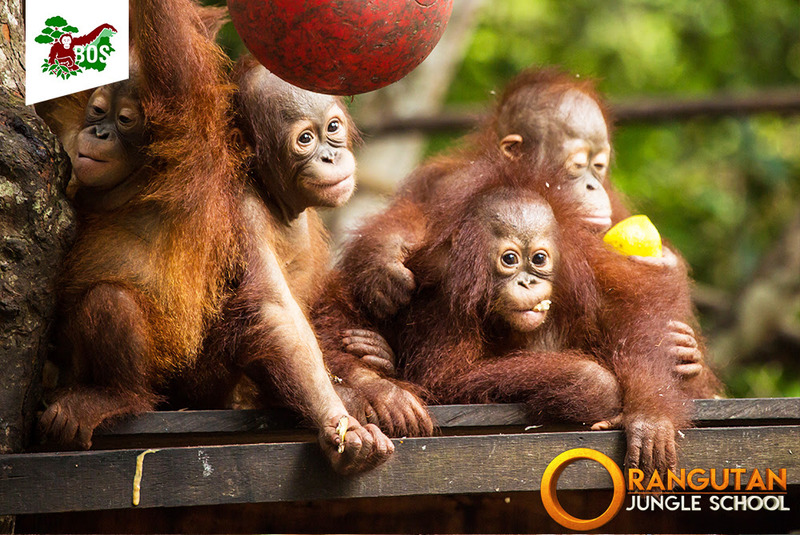 You can support the orangutans featured in Orangutan Jungle School by adopting them today! Playful Cinta loves to engage with her peers and babysitters, and will always find ways to surprise them; like throwing twigs in their direction from behind bushes, or suddenly crouching down in the path of an approaching babysitter. Nothing seems to deter her from her fun antics, and she is too quick for anyone to stop! She also has a special hiding place, away from the babysitters: up high in the trees. Cinta relies on her extraordinary climbing skills to quickly shoot up the trees and brachiate through the canopy, leaving her babysitters rushing to keep up. She certainly keeps the team on their toes! Sweet Meryl is a great role model for the juniors in her group: She has been known to take Jelapat and others into the forest to explore and demonstrate how to forage and build nests. Her peers are happy to engage in the process and enthusiastically follow suit. But she didn’t want to venture deep into the forest. It was only after she was encouraged by her friends that she bravely started to explore her surroundings. Jelapat is an active 3-year-old male orangutan who likes to climb trees and play with his best friend, Talaken, in Forest School Group 1. Whenever Talaken is worried or in danger, Jelapat will come to the rescue and give her a protective hug. She also does the same for him. Jelapat is a playful character who loves to wrestle babysitters to indicate that he wants to play. He always approaches new faces and seeks their attention. As restless as he may be, he is still well liked by his peers!